Captain Hiram L. Meeker and his Floating Bethel anchored at the end of Joralemon Street in the East River in Brooklyn were part of the chain of historical continuity that linked the Brooklyn waterfront of the 1700s through the Twentieth Century. He also continued the maritime tradition of holding Thanksgiving and Christmas services for sailors on Floating Bethels and in churches and chapels around the world. Stories covering his Christmas observances on the Floating Bethel appeared several times in New York newspapers, including the New York Times and the Brooklyn Eagle. Captain Meeker took command his Brooklyn Floating Bethel for his missionary work in 1893, after he purchased a former canal boat named the O.A. Crandall . The New York Times of March 13, 1893 told the story of the dedication of the O.A. Crandall, a three masted schooner, and Captain Meeker’s mission. Bethel is a Hebrew word that means “house of God” and Captain Meeker intended to make his Floating Bethel a house of God for sailors. The captain knew only too well how badly sailors needed a safe, snug haven to provide them with food, shelter, reading and writing material, and spiritual inspiration. He had spent at least twenty years sailing the seas of the world including the West Indies, and he had experienced firsthand some of the temptations that could keep a sailor battling rough waters even on land. He understood that shore bound sailors would feel more comfortable at a mission that moved with the tide instead of one fastened solidly to the ground. Searching around for a boat to be refitted for his Floating Bethel, Captain Meeker found the O.A. Crandall in the New Jersey flats and offered to buy her. When he put in his bid, he discovered that he fell $300 short of buying the Crandall. John Englis stepped forward with his purse in his hand and the O.A. Crandall became a Floating Bethel. With the backing of the Brooklyn Mission and Tract Society, Captain Meeker supervised the Floating Bethel’s fitting up to accommodate 250 people, and temporarily tied it up at Martin’s Stores near Wall Street. The captain scheduled his Floating Bethel to be open from noon to ten o’clock in the evening of every day. Besides the chapel, the Floating Bethel featured a reading room stocked with newspapers and magazines. The Floating Bethel officially opened on March 12, 1893, with three services. At a morning chapel service speakers included Dr. G. Le Lacheur, Secretary of the Brooklyn Mission Society; the Reverend W.H. Ingersoll, and Captain Richard Luce of Sailor’s Snug harbor. At the 2:30 service, the speakers included Alfred H. Porter, President of the Brooklyn Mission Society; the Reverend Doctor A.C. Dixon of the Hanson Place Baptist Church; the Reverend Dr. David Gregg of the Lafayette Avenue Church; C.W. Parsons; the Reverend Dr. Stitt of the American Seaman’s Friend Society; S.M. Marston; the Reverend A.B. Pritchard of the Arlington Avenue Presbyterian Church; and the Reverend Dr. Albert S. Hunt. An evening service featured the Reverend Dr. Charles Cuthbert Hall of the First Presbyterian Church and the Reverend Albert J. Lyman of the South Congregational Church. On March 14, 1893, Captain Meeker’s Floating Bethel was moved to the foot of Joralemon Street, Brooklyn, and remained there for over a decade. In 1762, Hendrick and Peter Remsen and Philip Livingston originally created a common road between their farms that extended to the East River. Early settlers in the area called the road Remsen’s Lane or Livingstone’s Lane. Then in 1805, Teunis Joralemon bought a farm on the road and people began to call it Joralemon Lane, and finally Joralemon Street. Joralemon Street continued to grow along with the neighborhood around the East River and New York’s system of linked water ways in general. Expanding trade and industry developed the East River waterfront on both sides of Joralemon Street. In 1817, the first regularly scheduled transatlantic cargo ship service to and from New York began and gradually New York became the center of national and international commerce. The completion of the Erie Canal in 1825 stimulated the development of the Brooklyn waterfront and a major system of docks and warehouses flourished. 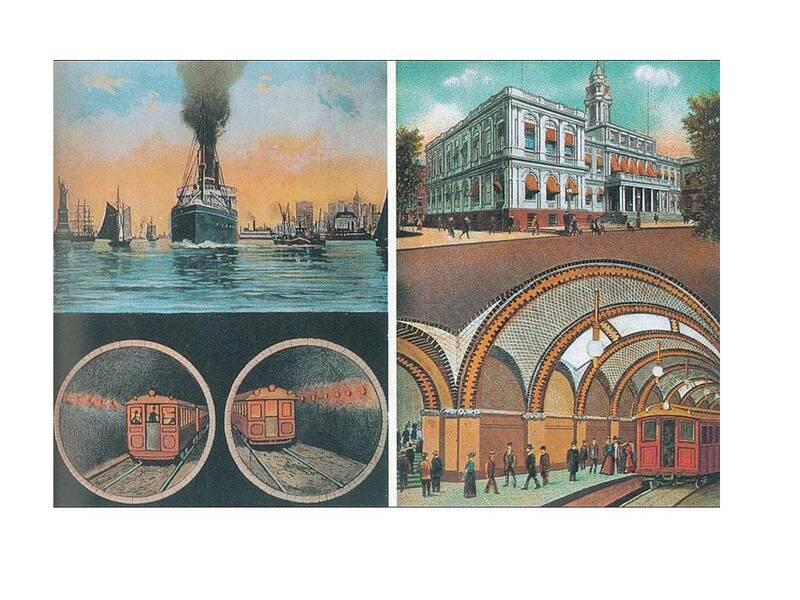 Brooklyn evolved as a place for transfer and storage operations because by water it stood close to New York’s commercial district yet far enough away from crowded lower Manhattan to allow plenty of room to build storage facilities. In the 1840s, businessmen like Jeremiah Robinson bought waterfront property and build docks, brick warehouses, and several grain elevators “rising like watchtowers.” Docks, wharves and storage houses in Brooklyn contained high bulk goods like glass, leather, oils and sugar and processed goods including coffee, liquor, salt, wool, and tobacco. The East River waterfront of Brooklyn and Queens became the site of several factories and shipbuilding and related industries. 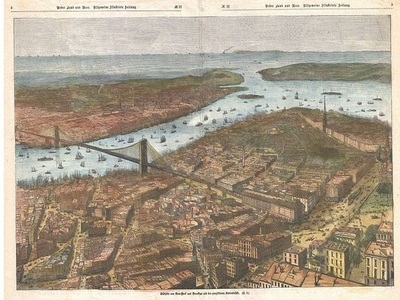 Revolutionary War veteran Joshua Sands developed an area of Brooklyn known as Down Under the Manhattan Bridge Overpass and operated a ship rope and cable works in the early 19th century. By the time Captain Hiram Meeker came to Joralemon Street with the Floating Bethel he anchored in the middle of a thriving waterfront district. Born about 1835 in New York, Hiram L. Meeker spent several years sailing the seas before he enlisted in a New York 2nd Heavy Artillery Regiment. One of the first documentary records about Captain Meeker appeared in the House of Representatives Private Claims, Vol. 2, dated 1853, when he unsuccessfully petitioned Congress for benefits for salvaging maritime wreckage. In 1864, the New York Times listed Captain Hiram L. Meeker among the country’s wounded veterans and in 1865 he was mustered out of his Heavy Artillery Regiment. Captain Meeker’s life improved when on February 12, 1870, he married Ann Lindley. The New York State Census of 1892 records him as living with his wife Annie, his two sons Walter and Hiram Jr., his daughter Florence and Annie’s mother, Mrs. Mary Lindley. On December 25, 1893, about 200 sailors and firemen belonging to steamships lying on the water front came to the Christmas Dinner at the Floating Bethel. Captain Meeker welcomed the guests and presided at the dinner that the members of the Christian Endeavor Societies of the Lafayette Avenue and Second Presbyterian Church helped to prepare. Singing by the sailors and speeches by prominent clergymen constituted the exercises of the evening. The Brooklyn Eagle of December 27, 1894, printed a story about the Christmas supper at the Floating Bethel. The story said that about 250 men sat down to eat turkey, mashed potatoes, celery, onion, cranberry sauce, mince and pumpkin pie and cakes of many kinds. The King’s Daughters of the Lafayette Avenue and Second Presbyterian Churches and friends of Captain Meeker provided the meal. Captain Meeker reported that the Floating Bethel also possessed a good organ and he provided statistics for the Bethel’s first years of operation from September 30, 1893, to September 20, 1894. Before the festive Christmas dinner Misses Cassin, Phillips, Hart, Burton and Zimmerman of Opportunity Circle and Miss Duncan, Miss Darling and Mr. Darling performed songs and recitations. The 1894 and 1895 Floating Bethel Christmas dinners were even larger festivities. The Brooklyn Eagle of December 27, 1895, reported that a large and jolly crowd of about 259 people gathered around the table to celebrate Christmas in the well lighted cabin on the Floating Bethel which sheltered under the shadow of the huge warehouses lining the East River. As they ate the wind howled over the bay and whistled through the rigging of ships causing them to tug and haul at their hawsers, but the ships and the Floating Bethel remained safe and snug in the harbor. The guests aboard the Floating Bethel enjoyed slices of steaming hot tasty turkey, both white and dark meat, and pyramids of mashed potatoes and turnips. They also ate cranberry sauce, celery, apples, generous slices of pumpkin pie and steaming hot coffee. While the men ate their Christmas dinner, the Brooklyn Eagle reporter examined the interior of the Floating Bethel. The reporter said that the reconstructed and refitted canal boat measured 95 x 17 feet, and had been paneled in real wood. A companionway occupied one end of the room and a raised platform or a stage at the other end. Several flags that Miss May and Miss Janette Englis had presented to the mission were draped around the platform an oil painting of a ship at sea hung in the center of the stage. The Floating Bethel’s quartermaster, Mr. Thompson, painted the ship Martello of the Wilson line, and the reporter pronounced its drawing and coloring excellent although Mr. Thompson had never had a painting lesson. Other pictures and decorations hung on the walls of the cabin, making it homey and pleasant. The Floating Bethel and its décor reflected Captain Meeker’s goal of making sailors feel at home and feel comfortable coming to the ship when they were alone and friendless in a strange place. The ship had a reading room and writing materials were arranged in another room. There were also a variety of games for sailors to play. Needy sailors were never turned from the cabin of the Floating Bethel and donations and workers came to the Floating Bethel from the City Mission, the Baptist Temple, the Olivet Chapel, and the Lafayette Avenue Presbyterian Church. Chaplain Meeker devoted full time to the Floating Bethel and his wife Annie and Miss K.A. Lattimer assisted him. The officers of the mission, Commodore Englis, first officer, N.P. Chase, second officer A.R. Robertson, purser C.D. Sayre, chorister Mr. Barnshem, and chaplain Reverend J.G. Snyder worked on the Bethel and the mission employed Dr. J.A. Kelly to care for the sick. Figures from December 25, 1894 to December 25, 1895 reflected the number of visitors continued to rise. After one of the ship officers prayed, Captain Meeker opened the meeting to the sailors. One old man who called himself an “old barnacle”, said that he was turned away from Sailor’s Snug harbor in the winter. Being destitute, he sought arrest when one of Captain Meeker’s helpers directed him to the Floating Bethel. He was given new clothes, converted and led a respectable sailor’s life since then. He made the door mats over the entrance of the Bethel. Another sailor related how happy his wife and children were because he had taken a temperance pledge and kept it. A New York Times story dated March 20, 1905 investigated how Captain Meeker celebrated his Twelfth anniversary on the Floating Bethel. Hans the blue eyed Dane, two Malays and one Fiji Islander, Danes, Norwegians, Russians, Japanese, Americans, Englishmen and Chinamen were among the sailors who walked the gangplank and enjoyed Captain Meeker’s welcoming whack on their shoulders as he stood decked out in his frock coat thumping greetings to everyone coming on board. After the men ate their turkey dinner they settled down for a time of singing with Captain Meeker’s voice lustily leading the way. “Pull for the Shore,” “Let the Lower Lights Be Burning,” “Home Sweet Home,” and many other songs resounded through the Floating Bethel and out over the Hudson River. Some of the notes echoed through the streets and skittered over the big warehouses. After they came aboard the Floating Bethel, the guests, at least 200 of them, took their seats at long tables set up in a room that resembled a library. At one end of the room stood a quarter deck and in back of it sat a model of a full rigged ship made by one of the Floating Bethel’s sailors. There was also a reed organ and a piano beside a pulpit like place in front. A red hot stove kept the room snug and warm. “Aye, aye, sir,” the sailors answered in chorus. “I want every man to do his duty tonight,’ ordered Captain Meeker, piping the mess call. “Aye, aye sir,” the men shouted. After everyone enjoyed the turkey with dressing, cranberry sauce, mashed potatoes and other trimmings, they tackled unlimited cups of coffee and spicy cake and mince pies solid as anchors. The sailors leaned back in their chairs, wiped their mouths, and with the backs of their hands reached for the new clay pipes and cut plugs and passed them around. A few landlubber guests also took pipes. Dr. Stewart, the Bethel’s surgeon, took a memorial sniff at the tobacco jar, since he had once known it well. The party began to break up around midnight and everyone gave three timber racking cheers for Captain Meeker, his blushing silver haired wife, his two pink checked married daughters and his several small grandchildren. Captain Hiram Meeker and his family and colleagues continued their work on the Floating Bethel for several more Christmas parties. House of Representatives. Digested Summary and Alphabetical List of Private Claims Which Have Been Presented to the House of Representatives. Vol. II. Washington, D.C.: Government Printing Office, 1853. Haw, Richard. 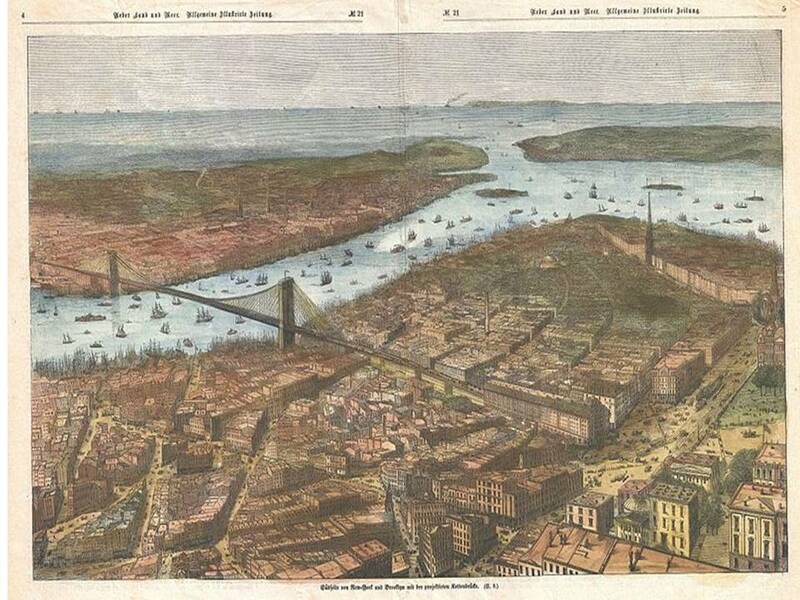 The Brooklyn Bridge: A Cultural History. Rutgers University Press, 2008.